The current figures are based on the results of a study which was done in 1991 over questions asked of six departments during a three month period, with the values for the average and marginal costs in subsequent years being estimated by assuming that the costs have risen by a weighted average of the inflation of consumer prices (25%) and of civil service wages (75%); the rationale for this choice of weighting is slightly unclear. A follow-up survey was considered and determined to be unnecessary in 1999 (i.e., the estimates obtained from indexation were deemed to be good enough). 3.1. For written PQs the marginal cost of one extra PQ can be taken as the Costs within Divisions [i.e., of departments] excluding the fixed cost of staff accomodation. This marginal cost is £50 per written PQ. This corresponded to, on average, about 2½ hours' work per answer. 2.1. At the time of the last review, in 1972, accommodation costs were excluded on the grounds that ``the work on PQs was so thinly spread over the work of the Civil Service as a whole and formed only a minor part of an individual's workload'' so that a marginal cost approach was then considered justified. 2.2. However, in 1991, answering PQs merits a prominent place in the work of departments and the use of full cost, including accomodation cost, is appropriate. 2.3. Only in one case is the marginal cost approach worth retaining and that is for calculating the cost of high cost written PQs to compare with the Disproportionate Cost Threshold. This contributes to ease of calculation. I agree with the conclusion of the final paragraph, but not with its logic. Surely the marginal cost is the correct one to use in considering whether the cost of answering a further, difficult, question is ``disproportionate''? In any case, I'm certain that the marginal cost is the one relevant to whether an MP should ask another question. -- i.e., a perfect straight line (as expected), but still no evidence for any fixed costs, which is bizarre given that the the 1991 survey certainly found some! The error here is that the quoted average costs are nonsense, because the indexation takes no account of the variation in the number of questions asked in each year; that means that the quoted annual total costs are also rubbish. Specifically, suppose that the costs in 1991 followed the model T = F + nd (total cost equals fixed cost plus number of questions times direct cost) and therefore the average cost A = F/n + d. In a later year the costs follow T' = F' + n'd' and A' = F'/n' + d'. However, the quoted average cost is not an estimate of A' but rather is iA = iF/n + id, where i is the indexation constant (1.59 by 2003); the difference between these two estimates, and therefore the correction to be applied to the quoted average costs, is iF(n - n')/nn'. 5.1. Average costs per PQ varied widely across departments. This partly reflected the style of the department concerned (ranging from ``fast throughput of large numbers'' -- up to ``in-depth consideration of potentially important subjects with due consideration''). [...] Consequently, the survey is felt to have provided a wide and representative mix. Its value is in the totality of the mix and, by agreement, separate figures are not being published for each department. So, in summary, I think the quoted average cost of answering a written question is something of a nonsense. However, the estimate of the direct (``marginal'') cost is relatively sensible, since it was based on a measurement of staff time expended. Happily it is the latter which is used to set policy (on the maximum cost of answering a question before it may be refused on grounds of disproportionate cost). Of course, we only have one estimate of this figure, from 1991, based on answers to about 1,600 questions, and with no estimate of its variability or accuracy. 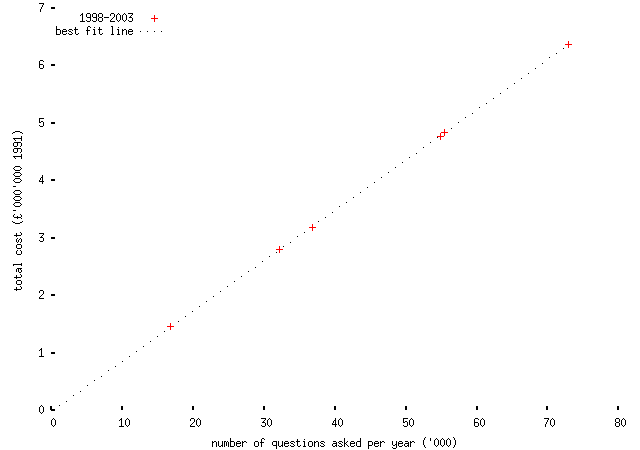 And whether typical answers still take around 2½ hours of staff time per question answered remains accurate today, almost fifteen years on, is less clear. For instance, you might expect that increasing use of IT will have made answering some sorts of questions much easier. Anyway, I'm not really sure what useful conclusion to draw from this, beyond that the Freedom of Information Act really works, and that no government statistics should be trusted until you've seen the methodology used to compile them. Task for next week: find someting more interesting to write about. Copyright (c) 2006 Chris Lightfoot; available under a Creative Commons License.